The sharpness and durability of your chain depends most importantly on two factors. The angle applied to grind the tip of the chain and the shape of front of the chain tooth. Whilst the sharpening angle of your chainsaw can be easily adjusted on the clamping device of the Oregon chain saw sharpener, the shape of the chain tooth is determined by the thickness and shape of the grinding wheel used. Therefore, whenever you do any chainsaw sharpening with the Oregon grinder, make sure you have correctly adjusted the cutting angle and selected the right grinding wheel for your chain. 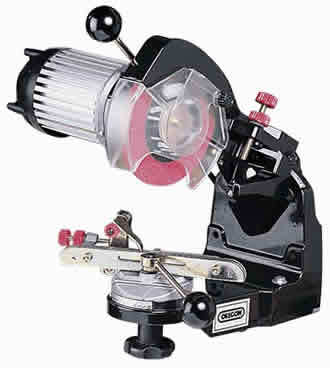 Even called bench mount grinder, the oregon grinder has not much in common with a standard bench grinder from your workshop. The sharpening process with the Oregon grinder is pretty straight forward. First, the chain is clamped in between two metal bar. These bars can be moved to different angles, adjusting the exact sharpening angle for the chain used. Details on which angle should be applied can usually be found on the box of the chain or the instructions manual of your chain saw. A little eccentric lever holds the chain firmly. Now put your safety glasses on. 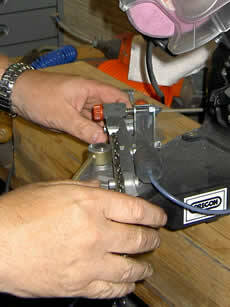 The machine is switched on and moved downwards with the grinding wheel sharpening the front of the chainsaw tooth. The movement is similar to cutting with a mitre saw. Additional adjustment screws allow fine tuning the depth of the grinding and how much of the tooth front should be grinded. Having sharpened the first tooth, the machine is moved up to its starting position. Now, the clamping lever is loosened and the chain moved to the next tooth. A little flipping pin guides the chain perfectly. As the teeth of a chain are angled in opposite directions, first sharpen all left angled teeth then swivel the clamping device to the opposite position and sharpen all right angled teeth. 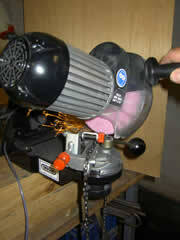 Make sure that during the sharpening, the grinding wheel does not burn the top of the chain's teeth. This could influence the hardness of the chain and reduce the durability of the sharpness. One final advice for those of you who do a lot of sharpening. Oregon offers a pneumatic clamping device which allows to clamp the chain automatically without using the lever. 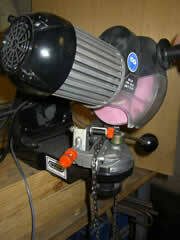 It is available as an accessory and makes the entire process sharpener even easier.